Studies have recorded a drop in biodiversity in the forest over the years. Krishna Birhor often complains of fever and bouts of vomiting. The 22-year-old depends on herbs from the forest to cure his illness. But he rues that it is just a matter of time when mammoth machines would ruthlessly chop off the forest depriving the naturopathic treatment. 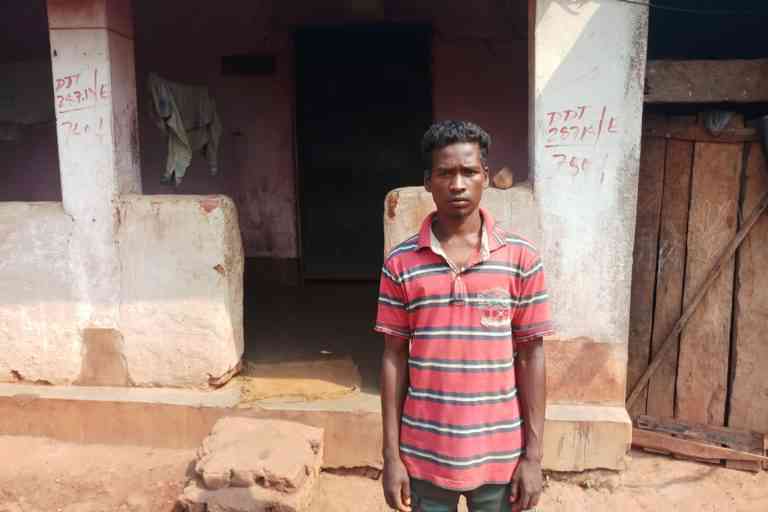 Krishna hails from Birhor tribe, a Particularly Vulnerable Tribal Group in the Tatiba village inside Saranda forest at Jharkhand’s West Singhbum district. The skinny youth complains that the mining companies have not only robbed him of his livelihood but have also kept several youth like him unemployed. “We sell herbs obtained from the trees for our livelihood but the mining has been destroying everything,” he said. “Thousands of trees have been chopped off for mining while our plight has been ignored. The mining companies do not even give us jobs stating that we do not have the requisite qualification. “Most of us are suffering from various ailments due to pollution from mining. We die a silent death every day but nobody is bothered,” he added, while pointing to the truckloads ferrying tons of iron-ore from the forest. Much has been written about the Ho and Munda Adivasis living inside the Saranda forest but the condition of Birhors, a nomadic group, is perhaps the worst. They have been ignored and are on the brink of disappearance thanks to the mining that has devoured Saranda, the largest Sal forest (Shorea robusta) in Asia. Like Krishna, around 200 others Bihors living in Tatiba village complain of ailments regularly but their remote location coupled with bad roads makes them completely inaccessible to the health services located several kilometres away. The excessive mining has contaminated the ground water forcing the community to depend on water tankers provided by the mining companies. The Birhors are a dwindling race accounting for only 0.06% of the 8.64 million Adivasi population in Jharkhand. Due to archaic modes of living, coupled with acute poverty and malnutrition, these Adivasis often die prematurely battling diseases such as malaria and typhoid. With an area of 82,000 hectares, the Saranda forest was once a natural habitat to various Adivasi groups and several wild species of plants and animals, and famed for its abundant green cover. It stands atop one of the world’s largest single deposits of iron ore – over 2,000 million tonnes. The region was also an important elephant corridor till the early 1990s and it is famously said that even the sunlight found it difficult to penetrate inside the dense forest. But today the picture stands completely changed. The mass felling of trees has turned Saranda into an industrial zone where nature is being brutalised and mutilated every day for its rich minerals. 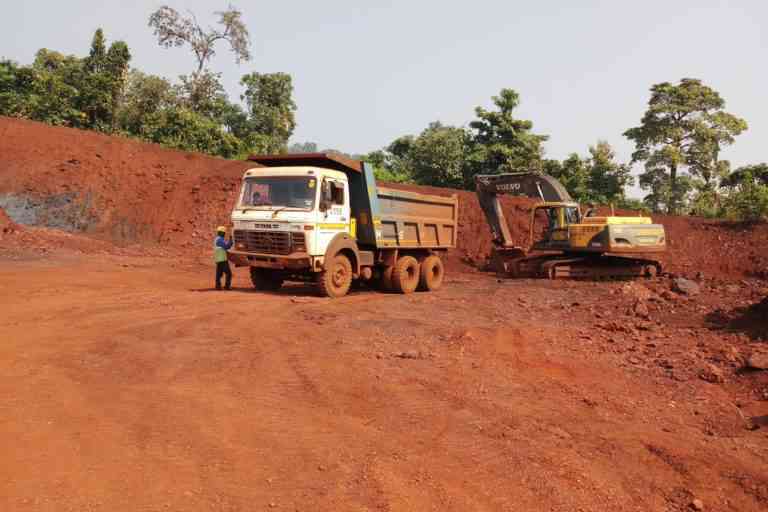 According to the Indian Bureau of Mines’ 2010 report, West Singhbhum is the most mined district in Jharkhand, and accounts for almost the entire share of iron ore mined in the state. Several mining companies such as Usha Martin, Steel Authority of India Limited and Rungta Mines, among others are involved in the extraction of minerals finishing its biodiversity with each passing day. To understand the impact of mining on the biodiversity of Saranda, the Union government appointed a commission of inquiry headed by Justice MB Shah on November 22, 2010. In response to the commission’s report, the Union Ministry of Environment, Forest and Climate Change constituted a multidisciplinary expert committee to assess the carrying capacity of the Saranda division. Both the inquiry commission report as well as the multidisciplinary expert committee report clearly state that increased mining activity had seriously impacted the biodiversity of the region. The Shah Commission further reported illegal mining worth over Rs 22,000 crore (Rs 220 billion) in Jharkhand and suggested cancellation of leases, recovery of lost revenue and punishing errant officials who colluded with the miners. The Commission found big corporates like Tata Steel, SAIL and Essel Mining as well as medium and small firms Usha Martin and Rungta Mines guilty of wrongdoings and violation of rules. It also stated that the companies were mining in as many as 40 leases in West Singhbhum, including dense Saranda forests, in violation of rules and regulations between 1994 and 2006. In 2015-2016, a study done by Wildlife Institute of India had found that the plant species in Saranda has reduced to 87 against 300 it once possessed. The research team led by Dipak Anand and Syed Ainul Hussain had also found that only 19 species of mammals belonging to 14 families while earlier research teams had documented over 30 species. The team also found just 116 species of birds, as compared to the 148 species found earlier. Significantly, the research team could not document a single sighting of an elephant. The 2010 elephant census had sighted 253 elephants, “The elephants have abandoned the traditional route due to excessive human settlements and mining. There has been no movement of elephants towards Ghatkuri area in Saranda since 2004-05 and other areas known for frequent movement of jumbos,” said Dipak Anand, project biologist at Wildlife Institute of India. The Wildlife Institute of India’s survey found that there were 10 active mines and 36 closed mines in the study area alone. In response to the report, the state government cancelled 17 mining leases. Gladson Dungdung, a human rights activist who has authored Mission Saranda: A War for Natural Resources In India, says that the successive governments have resorted to systematic killing of forest in the garb of whopping packages. He described the Rs 263 crore Saranda Action Plan announced by the then UPA government in 2012 as a ploy to silence those who have been protest more corporate entry for iron ore mining. According to the Saranda Action Plan, 62% of the Rs 263 crore package was likely to be spent on infrastructure development like roads and offices alone. The government had relaxed the restriction to have only unpaved roads inside reserve forests. A network of 130 km of cement-concrete roads was to be laid at an expense of Rs 104 crore. The project that was scheduled to be over by 2013 is yet to be completed. He claimed that around 14,410 hectares of the total forest land has already been brought under mining and things would turn worse if government grants permission to mining companies in future. 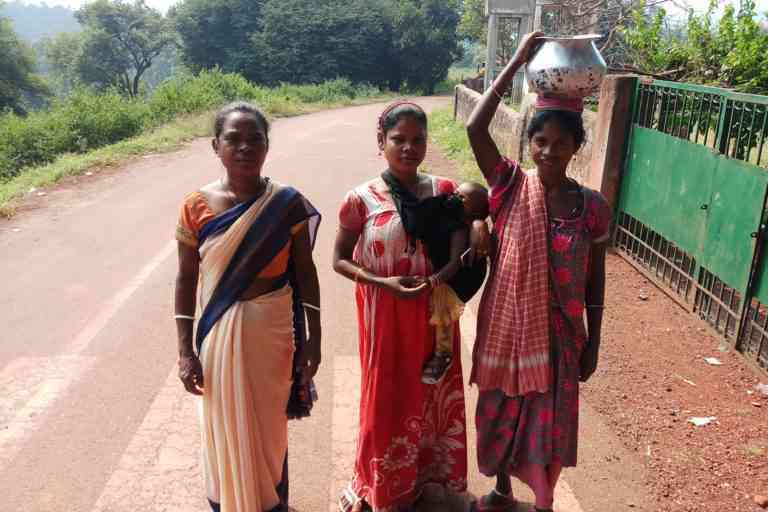 Analysts say the mining leases inside Saranda are in violation of the Fifth Schedule of the Indian Constitution that protects the rights of Adivasis like the Ho and Birhors. The Fifth Schedule requires the government to consult and seek the advice of Tribal Advisory Council on matters of general welfare and transfer of land. Excessive production is also dubbed “illegal” under section 21 (5) of Mines and Mineral Development and Regulation Act 1957. “The mines are blatantly flouting the rules by extracting more minerals than prescribed. The trucks carrying minerals are causing havoc to the environment by deviating from the original path,” said RK Singh, a Delhi-based environmentalist and wildlife expert. “The officials are mute spectators because a nexus among all stakeholders runs deep. The widening of the roads and use of heavy vehicles is killing the forest and also the relationships between predators and prey species,” he added. Singh, who conducted research on the Saranda forest between 1993 and 2000, pointed out that mining has transformed Saranda into an ecologically fragile zone. “The forest located on the upper region of the hills absorb water during rains and discharge it during the lean periods. It rejuvenates the river system. But the mass felling off trees has been destroying the natural mechanism and has spelled disaster to the environment,” he said. Quite true to his words, the spring-fed river Koina that had ample water across the year now looks like a stream or even a drain in several places with dust particles from the mines turning its colour red and unfit for any use. Still, hapless villagers are seen bathing and washing their clothes on its banks. The constant movement of the vehicles carrying minerals has also posed serious threats to hundreds of school-goers in the vicinity, “There is a risk of students contracting ailments because of the flying dust carrying pollutants. 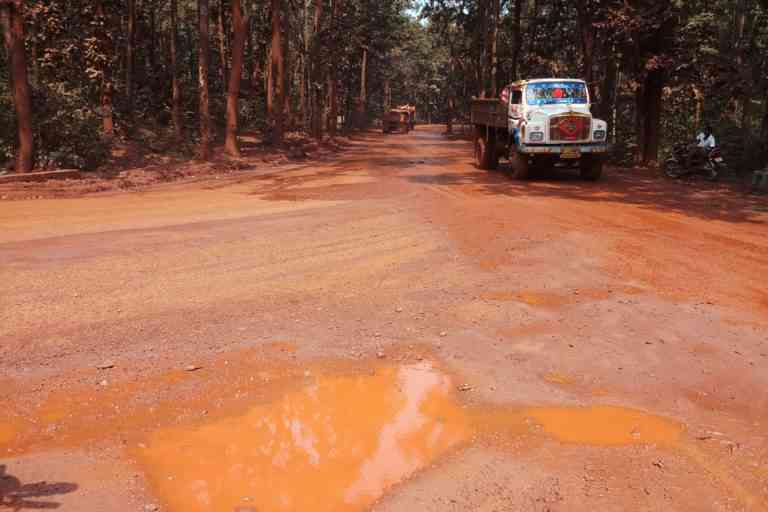 It is better if the vehicles take an alternative route as the trees are becoming red here due to the deposit of minerals,” said Priyanka Mahanta, headmistress of State run Primary school in Noamundi where over 150 children study. 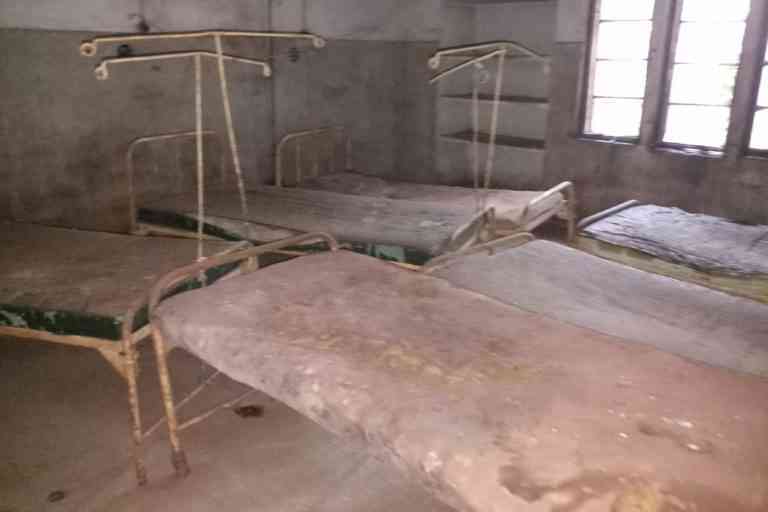 The health services are in tatters in Saranda as the state-run hospitals located around 10-12 kilometers away in Bara Jamda are either closed or reeling under severe shortage of infrastructure and medical staff. Villagers have to go to bordering Odisha for treatment. 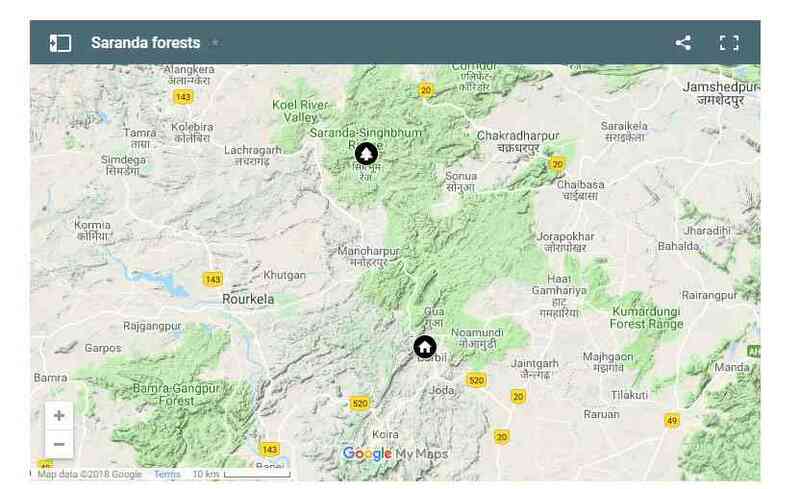 When contacted, Sunil Kumar, the Officer on Special Duty of forest and environment department in Jharkhand said that the government has various schemes and projects to save the Adivasis and forests in the pipeline, though he refused to specify any of them. But reality speaks a different story. There are many mining companies in the queue to get the environmental clearance, which would lead to further degradation of Saranda and its habitants. But who cares?